Bananas may be one of the most popular fruits sold in the United States. Grown commercially as a food source, bananas also feature prominently in warm region gardens and conservatories, making striking additions to the landscape. When planted in areas with plenty of sun, bananas are not all that hard to grow, but problems with banana plants are bound to crop up nonetheless. 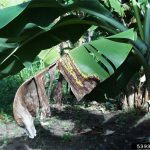 What kinds of banana plant pests and diseases are there? Keep reading to find out how to solve problems with banana plants. Bananas are moncoyledonous herbaceous plants, not trees, of which there are two species – Musa acuminata and Musa balbisiana, native to Southeast Asia. Most banana cultivars are hybrids of these two species. Bananas were most likely introduced to the New World by Southeast Asians around 200 B.C. and by Portuguese and Spanish explorers in the early 16th century. Nematodes – Nematodes are a common banana plant pest. They cause rotting of the corms and act as a vector to the fungus Fusarium oxysporum. There are a number of different species of nematode that like bananas as much as we do. Commercial farmers apply nematicides, which when properly applied, will protect the crop. Otherwise, the soil has to be cleared, plowed and then exposed to the sun and left fallow for up to 3 years. Weevils – The black weevil (Cosmopolites sordidus) or banana stalk borer, banana weevil borer or corm weevil, is the second most destructive pest. Black weevils attack the base of the pseudostem and tunnel upward whereupon a jelly-like sap oozes out from the entry point. Different pesticides are used commercially depending upon the country to control black weevils. Biological control utilizes a predator, Piaesius javanus, but has not been shown to have any truly beneficial results. Thrips – Banana rust thrips (C. signipennis), as its name suggests, stains the peel, causing it to split and exposes the flesh which then begins to rot. Insecticidal dust (Diazinon) or a spraying of Dieldrin can control thrips, which pupate in the soil. Additional insecticides combined with polyethylene bagging are also used to control thrips on commercial farms. Scarring beetle – The banana fruit scarring beetle, or coquito, invades the bunches when the fruit it young. The banana scab moth infests the inflorescence and is controlled with the use of an injection or dusting of pesticide. Sap-sucking insects – Mealybugs, red spider mites and aphids may also pay a visit to banana plants. There are quite a number of banana plant diseases that can afflict this plant as well. Sigatoka – Sigatoka, also known as leaf spot, is caused by the fungus Mycospharella musicola. It is most commonly found on areas of poorly draining soil and areas of heavy dew. The initial stages show small, pale spots on the leaves that gradually enlarge to about a half inch in size and become purple/black with gray centers. If the whole plant is infected, it looks as if it has been burned. 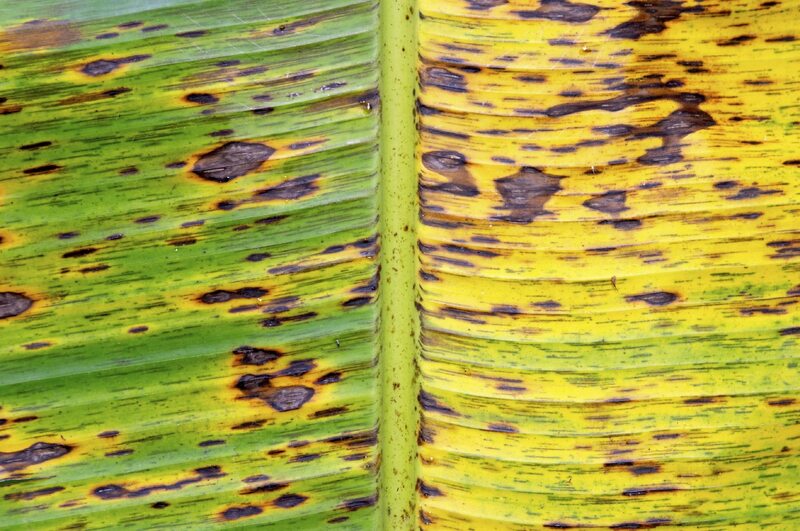 Orchard grade mineral oil can be sprayed on the banana every 3 weeks for a total of 12 applications to control Sigatoka. Commercial growers also use aerial spraying and systemic fungicide application to control the disease. Some banana cultivars also show some resistance to Sigatoka. Black leaf streak – M. fifiensis causes Black Sigatoka, or Black Leaf Streak, and is much more virulent that of Sigatoka. The cultivars that have some resistance to Sigatoka show none to Black Sigatoka. Fungicides have been used to try and control this disease on commercial banana farms through aerial spraying but this is costly and difficult due to scattered plantations. Banana wilt – Another fungus, Fusarium oxysporum, causes Panama disease or Banana Wilt (Fusarium wilt). It begins in the soil and travels to the root system, then enters the corm and passes into the pseudostem. Leaves begin to yellow, starting with the oldest leaves and moving in towards the center of the banana. This disease is lethal. It is transmitted through water, wind, moving soil and farm equipment. On banana plantations, fields are flooded to control the fungus or by planting a cover crop. Moko disease – A bacterium, Pseudomona solanacearum, is the culprit resulting in Moko Disease. This disease is the chief disease of banana and plantain in the western hemisphere. It is transmitted via insects, machetes and other farm tools, plant detritus, soil and root contact with ailing plants. The only sure defense is to plant resistant cultivars. Control once the bananas are infected is time consuming, expensive and resistant. Black end and Cigar tip rot – Black end stems from another fungus that causes anthracnose on the plants and infects the stalk and fruiting end. Young fruit shrivels and mummifies. Stored bananas afflicted with this disease rot. Cigar tip rot starts in the flower, moves to the tips of the fruit and turns them black and fibrous. Bunchy top – Bunchy top is transmitted via aphids. Its introduction almost wiped out the commercial banana industry in Queensland. Eradication and control measures along with a quarantine area have managed to stamp out the disease but growers are eternally vigilant for any signs of bunchy top. 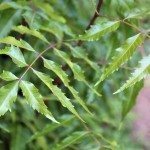 Leaves are narrow, short with upturned margins. They become stiff and brittle with short leaf stalks that give the plant a rosette look. Young leaves yellow and become wavy with dark green “dot and dash” lines on the undersides. These are just some of the pests and diseases that can afflict a banana plant. Vigilant attention to any changes in your banana and prompt attention will keep it healthy and fruitful for years to come.